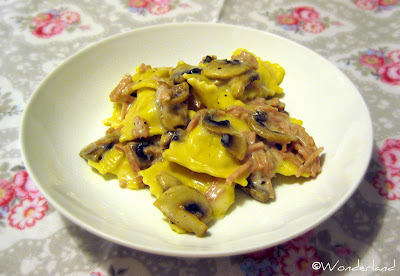 For some odd reason here in Finland I don't eat tortellini and ravioli as often as I used to do in Italy. So here's a very simple and tasty sauce to eat your tortellini with! 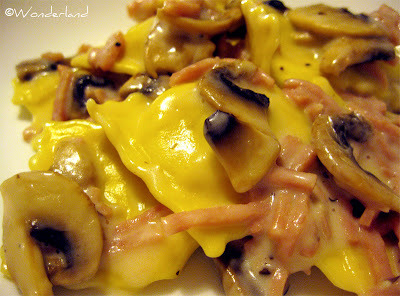 NOTE: These tortellini were filled with ham but also differently filled ones are just fine. Chop garlic finely, wash and slice the mushrooms. Saute chopped garlic in a saucepan with oil over medium heat then add the mushrooms and cook for about 5 min. Add the ham slices, cook for few minutes stirring. Pour the cooking cream, stir, and let cook at low heat until the cream gets thicker. Add salt and pepper up to taste. When the water boils, drop in it the tortellini and cook until al dente. Mix the tortellini with the sauce and serve with parmesan cheese. I really like the look of this (minus the mushrooms for me). Yes, YES - let there be GREAT THINGS HERE!